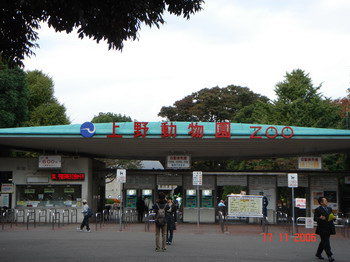 The Ueno Zoo (恩賜上野動物園 Onshi Ueno Dōbutsuen) is a zoo, owned by the government of Tokyo, and located in Taito Ward, Tokyo, Japan. Japan's first and now most famous zoo, it opened on March 20, 1882. Its location, a five-minute walk from the Park Exit of Ueno Station, makes access from Tokyo's public-transportation network convenient. The Ueno Zoo Monorail, the first monorail in the country, connects the eastern and western parts of the grounds. During World War II, fearing that bombs could potentially hit the zoo, thus having wild animals wreaking havoc in the streets of Tokyo, the Japanese army ordered for many of its livestock to be poisoned to death. The giant panda, Sumatran tiger, and western lowland gorilla head the list of the zoo's population of 422 species (as of March, 2003). 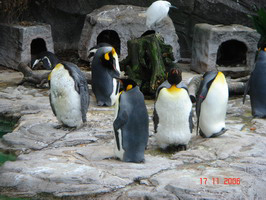 Ueno has more variety than any other zoo in the nation. Within the limits in which it operates, the Ueno Zoo attempts to provide the animals an environment similar to the natural habitat. Redistribution of the animals among Tokyo's other zoos (including Tama Zoo and Inokashira Nature Park) left Ueno without a lion. However, in response to public demand, Ueno borrowed a female from the Yokohama Municipal Zoo.